My trackable Travel Tag – The Oceantagz fish. Where am I and where’ve I been? Find me on my google map when we’re out cruising. 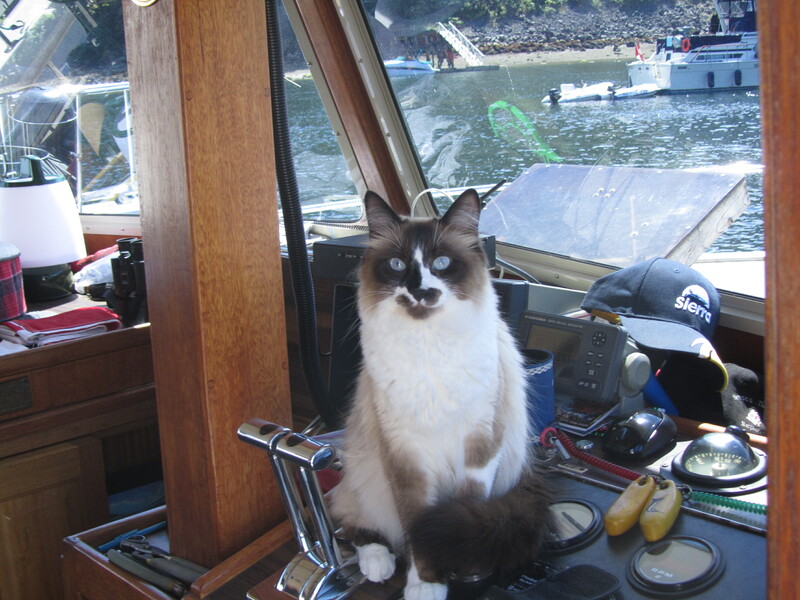 If you’re a boater in the area, you can come visit me and I’ll even purrform a few tricks fur you if you do. You can also see where I’ve been on my Geocaching.com map and all the geocaches I’ve visited. “Discover me“! If you’re a geocacher you can virtually find me anytime by looking up my reference number TB5DY7V and entering my tracking code OZ5JHK when you add a log entry. My Travel Bug Tag is the Fish in the OceantagZ series. If you’re unfamiliar with what geocaching is, it’s a worldwide GPS enabled treasure hunt, where anyone (even you) can hide a weatherproof container of “treasure” and list it’s GPS coordinates online for others (even you) to get and then go find it. To find the treasure in the real world you’ll need to plug those coordinates into a pawheld GPS device and it will show you where it is on map. Most smartphones nowadays have a GPS built-in and you can download an app for it. My mom uses one on her iPhone which has offline features so you don’t need cell phone service for it to work. When you find a treasure, you can physically sign it’s log book, trade items found inside, help a trackable on its mission, and if you have an account with geocaching.com you can log online that you “found it”. Your geocaching.com account keeps track of all the treasures that you hide & seek. There are over 2 million hidden geocaches worldwide, and over 5 million geocachers looking for them. There are thousands of them right here along the Pacific West coast that are accessible by boat and my mission is to find as many of them as I can.